A Madison Police Department officer shot a 19-year-old black man Friday night, prompting more than 100 protesters to gather at the Williamson Street area and stage a sit-in at the City-County Building. Protesters said the name of the man killed was Tony Robinson, although MPD did not confirm his identity. Robinson was a graduate of Sun Prairie High School and was planning on attending Madison College, according to a Facebook post from Dane County Boys and Girls Club CEO Michael Johnson. In a news conference, MPD Chief Mike Koval said officers responded to reports of a disturbance where a man, who may have also been responsible for a battery, was jumping in and out of traffic. The first responding officer was called to the apartment the subject had entered, Koval said. The officer forced entry into the apartment after he heard a disturbance. Koval said the subject assaulted the officer and during the struggle, the officer drew his gun and shot the subject, the Wisconsin State Journal reported. Koval said he did not know if the subject was armed but that initial findings at the scene did not reflect a gun. Koval said he did not know how many times the officer shot and that he administered CPR. Robinson was pronounced dead at the hospital. Protesters said the officers shot an unarmed Robinson five times. The state Department of Justice’s Division of Criminal Investigation is taking lead on the investigation, and MPD will only provide supplemental needs if requested, Koval said. The Young, Gifted and Black Coalition said in a statement that reports between the police and victim’s friends differed and likened it to the cases of Michael Brown in Ferguson and Eric Garner in New York. Robinson’s friends and family joined the protests both on Williamson Street and at the City County Building. Samantha Sorum, 16, said Robinson was her friend. A woman who used to babysit the victim as a child led the crowd in prayer and Robinson’s aunt, who is pregnant, said she plans on naming her unborn child after him. The crowd, which first gathered at the intersection of Williamson Street and Few Street, then walked to the City County Building, where they staged a sit-in. Madison Mayor Paul Soglin was in attendance. Rep. Chris Taylor, D-Madison, said in a Facebook post that she witnessed the incident. Taylor was the lead sponsor on legislation that reformed the process of investigating officer involved shootings. Taylor’s bill came after an MPD officer shot and killed 30-year-old Paul Heenan of Madison, who was intoxicated and walked into the wrong house — leading police to think he was committing a burglary. 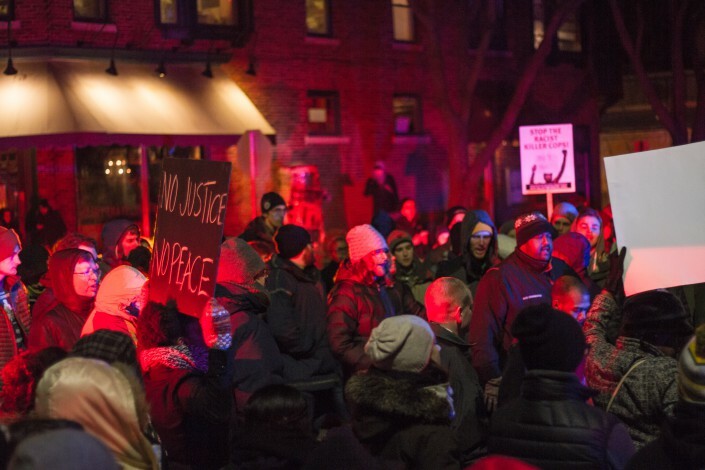 An internal investigation cleared Stephan Heimness, the officer who killed Heenan, of charges. Last December, more than 800 University of Wisconsin students and supporters held a die-in demonstration on campus protesting police brutality. 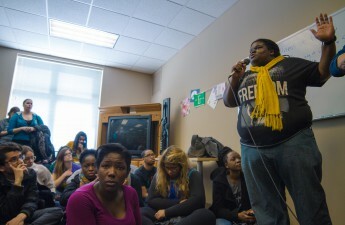 The Young, Gifted and Black Coalition, which has remained active in the cause, released an open letter to Koval earlier this year calling for more self-governance among the black community in Madison. The group is planning on hosting a 10:30 a.m. strategy session at the YWCA Saturday. Polo Rocha and Tara Golshan contributed to this story. This post has been updated. Clarification: A previous version of this story made references to Willy Street, a colloquial name for Williamson Street.